This is the article insights complete users guide. You are not required to read this from tip to toe but you should jump to the sections that you are most interested in. 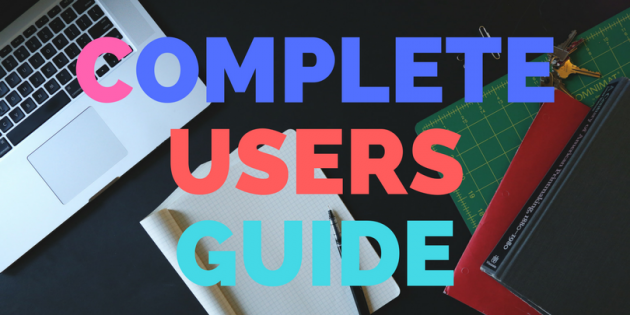 This guide will thoroughly explore every nook and cranny of the app and teach you how to get 100% out of its myriad of features. Before you can start analyzing keywords and writing articles you need to group them into sites. This allows us to generate some statistics about the site, such as the number of keywords being tracked and the overall article score. Click on the “Add Site” button to add a site. The “Add New Site” window pops up. Region you are targeting. Eg your site might be targeting only customers in America. 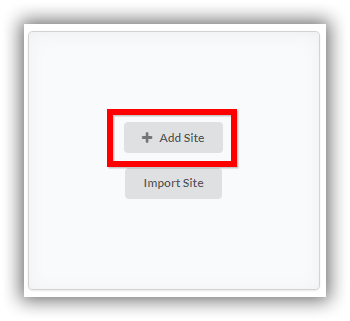 Click the “Add” button to add your site. If you need to change any of these settings, you can do it in the Page Audits screen by clicking on your site card. 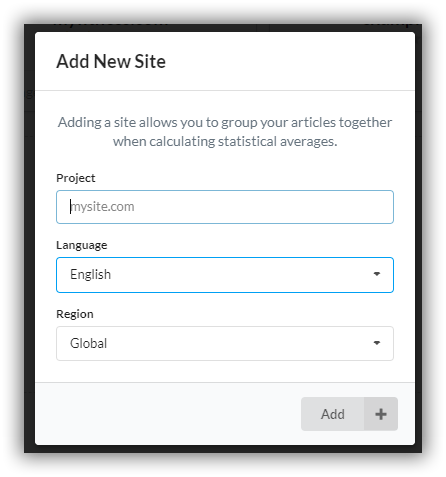 You can import a list of the most popular web pages from your Google Analytics account. 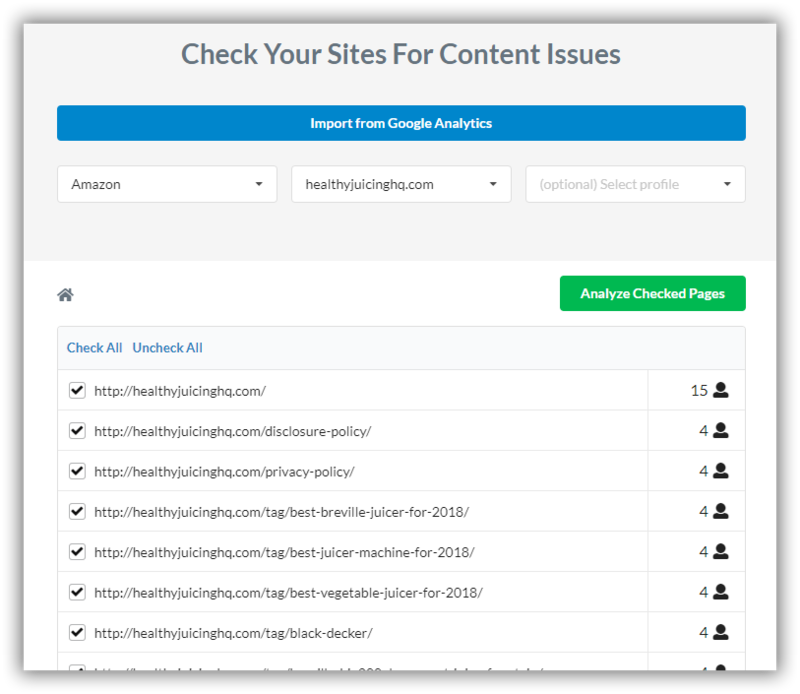 This allows Article Insights to run a site audit on all your content and tell you how to further improve your content. Every site you add, tells you 3 things on the site card. The overall content optimization level based on a 5 star rating. Clicking on any site card takes you to the Page Audits window. Here you can view the individual keywords and pages under each site. This is a simple operation. Just click on the “Enter a keyword” box and type a title or keyword of the next article you would like to write about. 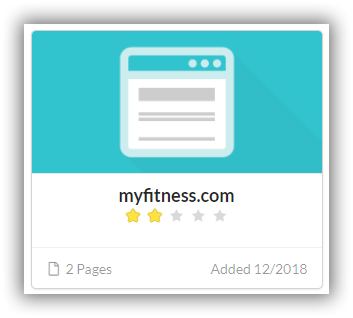 In addition to running research on a keyword, you can also add a tracking URL of any existing article you wish to compare (Yours or even a competitors). 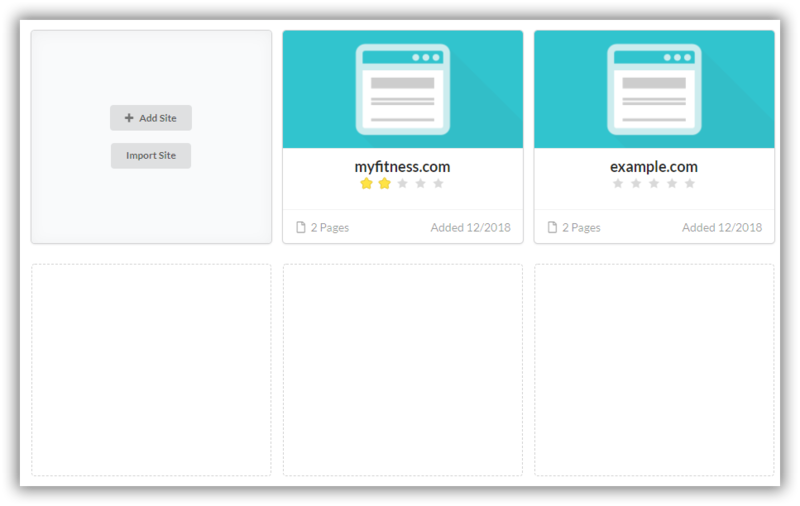 This will then generate a “Used Keywords” score which will tell you how many keywords are being used on the page and are missing. The word count and article score is not generated from the tracking URL. On the Page Audits screen, you can change any site info. Just click on the “Edit” button located in the top right hand corner of the site card. If you change the language or region of the site, you will have to manually refresh each keyword by clicking on the “Recheck” button. Your focus keywords will not be reset, so you will need to remove and re choose new ones. Each page has a controls button. Recheck – Re-run analysis to get newer up to date information about the keyword. View – Go into the article writing screen & view more information about the keyword. These buttons are context sensitive, you might see a “cancel” button if the analysis is being worked on by the server. You can restart failed, or stuck keywords at anytime. Click on the “view” button on any page audit row to take you to the Article Writing screen. There is quite alot to un-pack on this screen, so lets visit it one area at a time. Anything you write in the editor is auto saved to our server. You will not lose your work. On the left hand side is the article performance panel. Your article is scored out of 100. You only need to achieve a score of 75+ for an article to be optimized. The target word count is the average word count across 30 of the top ranking sites in Google. Use this as a guide to how many words you should write to be competitive. The current word count of your article is also shown. 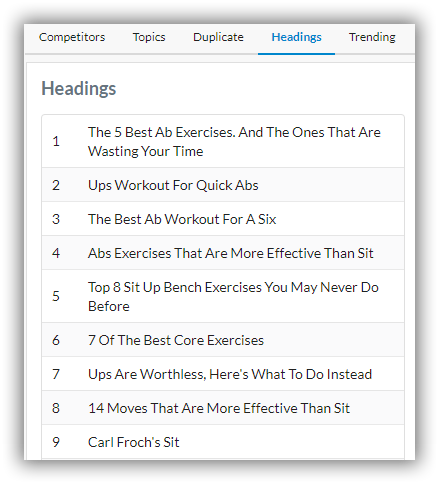 Article Insights automatically suggests the most popular and important keywords you should use in your article. If you have met the recommendation, the keyword is colored blue. Each keyword ships with its own store of popular sentences written by the top 30 websites. 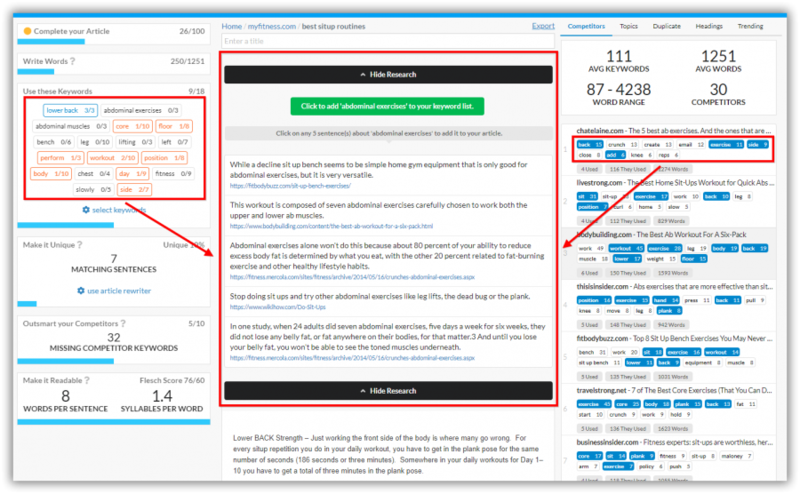 As you write or use this research, a uniqueness score is calculated so that you don’t accidentally publish an article with duplicate content. Use the “article rewriter” tool if you need help making content unique. The competitiveness score, compares your article against the top 10 sites. Specifically, it tells you what keywords your competitors are using but that you have missed out on. To beat a competitor you need to use at least 5 out of the 10 keywords listed in the competitor detail panel on the right hand side. 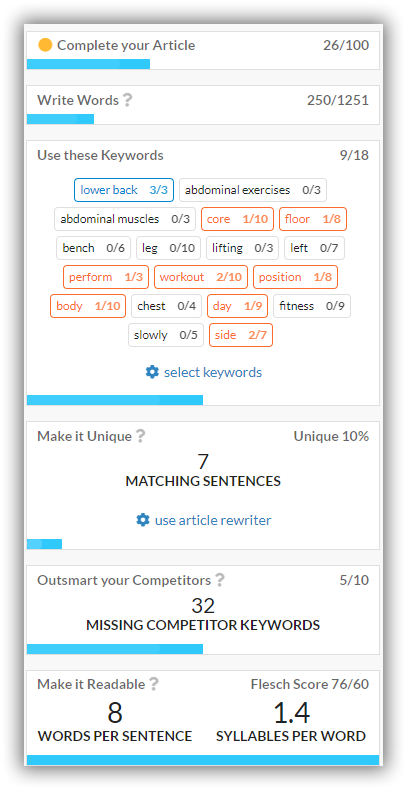 Used keywords are colored blue. How easy it is to read your article is calculated using the Flesch score. Quite simply, use less words per sentence and use less syllables per word to improve this score. Both statistics are shown to you so you know what needs to be worked on. You want a score of 60+. Anytime you click on a “keyword” label, it opens up the research panel in the middle of the article editor. 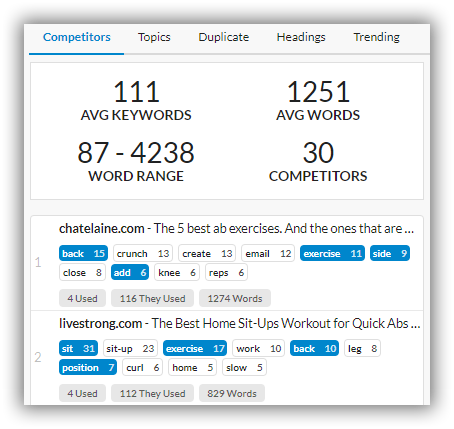 Use this to see what your competitors are writing about for that keyword. 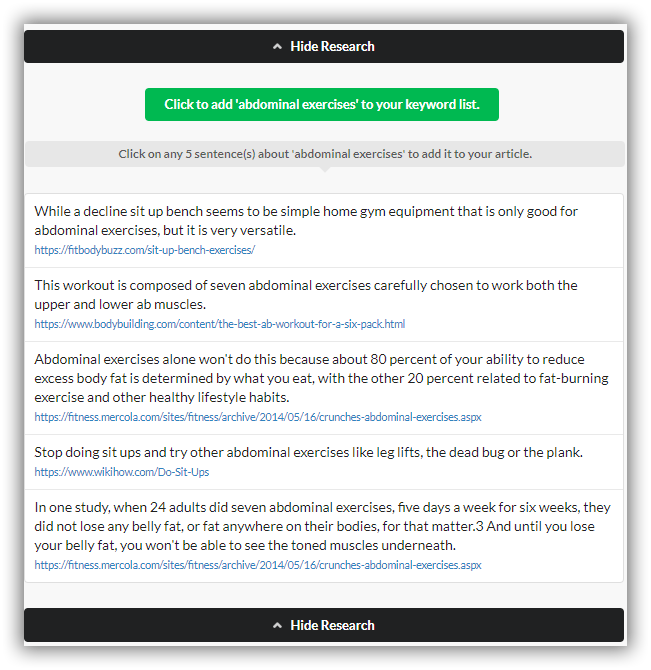 If you click on any research row, it adds that sentence to your article. This is a quick and easy way to jump start your article and see how keywords are being used. See exactly what keywords are being used by your competitors and how many words they have written. 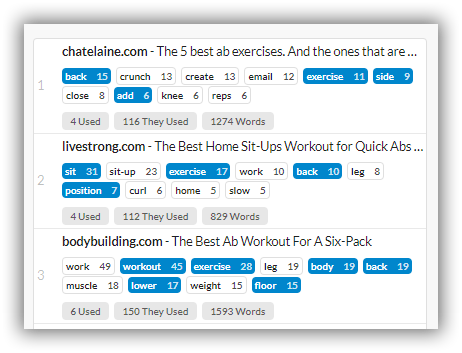 The first label, tells you how many keywords you have used in your article. 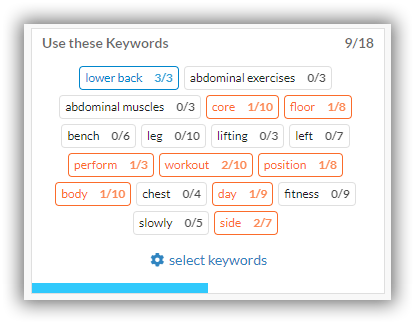 The second label tells you how many the keywords in total the competitor has used. (Click on the competitor row to see a list of all these keywords). The last label is the word count of their article. By clicking on any competitor row, you get a competitor detail pane show up in the middle of the article editor area. Here you can see exactly what keywords were used and how many times that keyword appeared in their article. Its very common for keywords to appear together to represent a topic. The topic tab shows you these groupings. 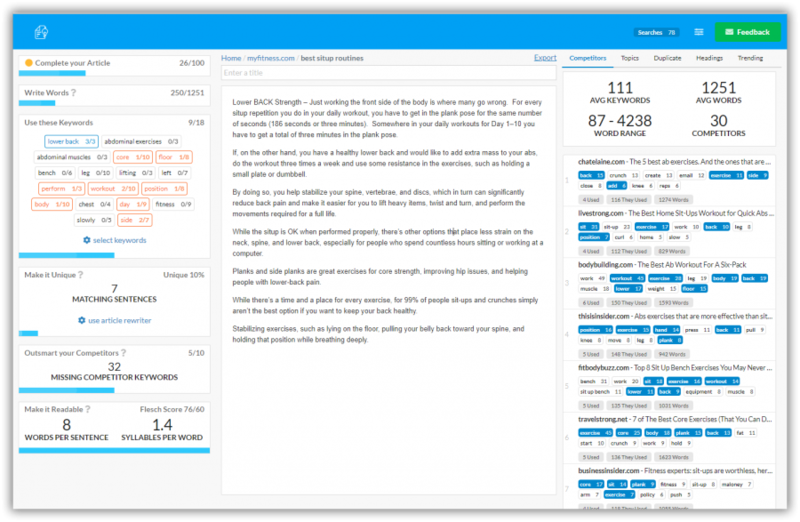 As you write, Article Insights will try to guess what sentences best fit a known topic. As you can see above, Topic 3 – Is about ab workouts. 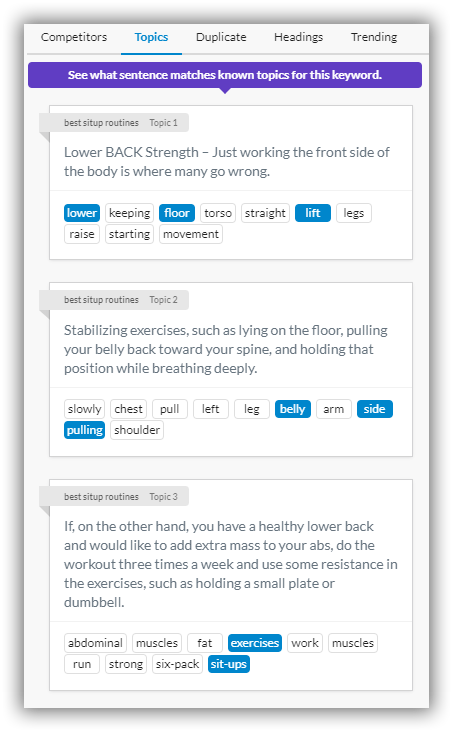 The keyword labels show you what other words should belong to that topic. All you need to do is use the extra related words in your sentence to drastically improve the quality of your already existing content. NB. That these aren’t just synonyms. These are words that are commonly found together. Something you can’t discover using a thesaurus. 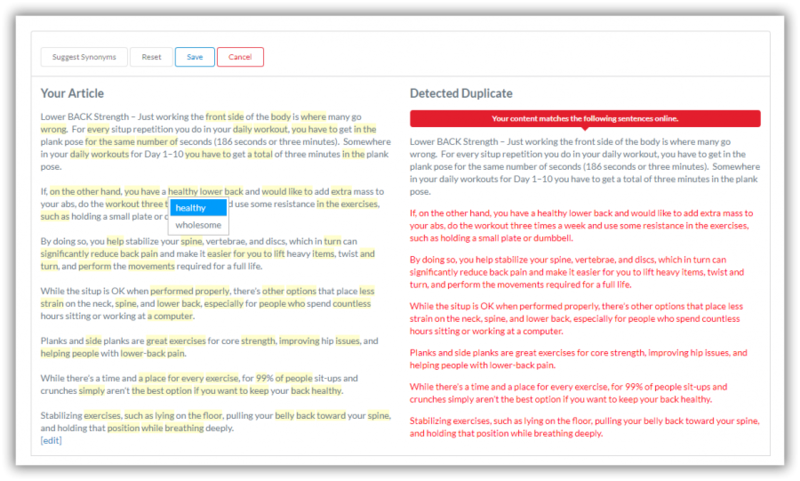 Duplicate content is highlighted in red. 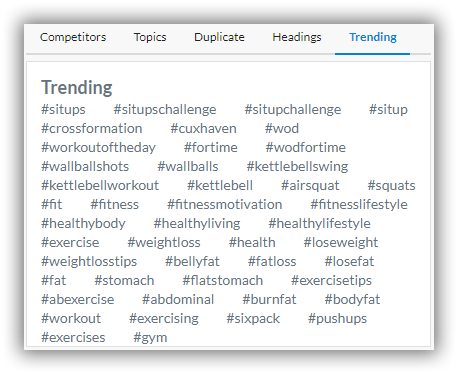 Not always available, but where its found you can get a list of popular trending tags. Works best for short keywords. 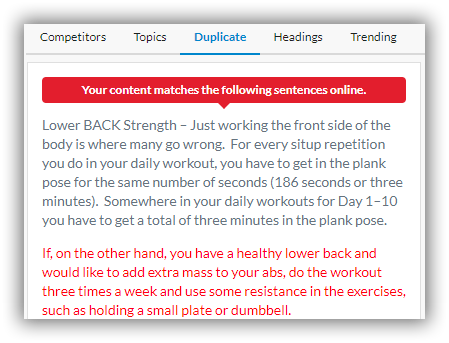 Article Insights ships with its own article re-writer tool that suggests synonyms for your content. Mouse over any yellow text to see a drop down list of suggested synonyms.